These Easter and Passover activities have been updated for 2019, and we will continue to add more events as they are announced! This year, Easter falls on April 21st. Other important dates associated with Easter are: Palm Sunday, April 14th, and Good Friday, April 19th. Passover begins the evening of Friday, April 19th, and will continue until the evening of Saturday, April 27th. Easter egg hunt for each age group, photos with the Easter Bunny, games, prizes and a coloring contest! Age-appropriate egg hunts scheduled every two hours to find fun-filled eggs of all types! Butterfly release, pig races, pony rides, petting zoo, a spring craft zone, and wagon rides. Admission, and some events are an additional cost. Join us for your Easter celebrations this year with our annual Easter in the Park service! We will have free games, food, Easter egg hunt and an Easter Bunny for pictures! The "hunt" begins promptly at 10:00 AM and Mr. E. Bunny will be in attendance. Ages 1-10 years; ages hunt separately. Don't forget to bring your own basket, as well as a non-perishable food item for the Santa Clarita Food Pantry. Sponsored by the Saugus Action Committee and the City of Santa Clarita. 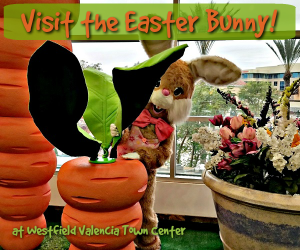 Activities include continuous egg hunts for kids under 10, carnival games, face painting, food, and a visit from the Easter Bunny. No cost - donations of canned foods will be accepted. Photo opportunity with the Easter Bunny! Bring the whole family - pets too! Visit with the Easter Bunny and have a photo taken with him. He's available Mon-Sat, 11am-8pm; Sun, 11am-6pm. Located on Level 1 near H&M. Always open to the public and conveniently located on Copperhill Road (near Seco Canyon Rd), the service begins at 6:30 AM in the beautiful outdoor amphitheater. Join the Italian Catholic Club of SCV in celebrating what Italians celebrate after Easter, called La Pasquetta. A traditional Italian dinner will be served. Six lucky children 10 years and under will receive a chocolate egg from Italy that has a surprise in it. There will be bingo playing, magic, Karaoke singing and heritage learning. $20 per person. Please contact Anna Riggs for reservations and additional information at 661-645-7877 or Italians@iccscv.org. The limited chairs fill up early, so bring a blanket. The resurrection is timed to coincide with sunrise. Family Community Church, Living Springs Foursquare Church, Acton Faith Bible Church, Crown Valley Community Church and Shepherd of the Hills host this annual public event. 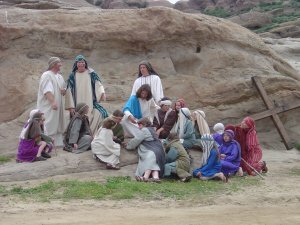 The dramatic presentation includes more than 60 costumed actors. Dress warmly, and bring towels to mop up the chairs from the morning dew. Part of a weekend celebration that actually begins with two outdoor Good Friday services. A complimentary continental breakfast with coffee and water will be available on Sunday prior to the Easter service. For families, there will be a shaded area at the field with room for the kids to run, activity packs available for them to work on during the service, and blankets available. Come Celebrate the Resurrection! Children's Sunday School will include an Easter Egg Hunt during both Easter Sunday Services. Arrive 45 minutes prior to the service for bounce houses, lawn games, face painting, family photo opps and more! The Chabad of SCV invites you to a Communal Seder and Passover services with a four-course meal. Multi-generational communal seder with special activities for the younger generation. Please join Temple Beth Ami this year at its community Seder, led by Rabbi Mark Blazer and Cantorial Soloist Alyssa Rosenbaum. Fun for all the family and a great meal is included. Invite your friends in the community so they can experience the warmth that Temple Beth Ami has to offer. Tickets required.